Pennsylvania has always been an energy leader, but we risk becoming an energy laggard if we fail to embrace solar energy. As a state that currently gets less than 0.5% of its electricity from solar photovoltaic technology, we have a lot of work to do. That’s why Solar United Neighbors is excited to see the Commonwealth’s Department of Environmental Protection release the final version of Finding Pennsylvania’s Solar Future, which lays out ambitious but achievable strategies for how we can generate 10% of our electricity from solar by 2030. These strategies include measures such as allowing community solar, dramatically increasing the solar carve-out, and creating new tax incentives to encourage the growth of solar. The report, which was funded by the US Department of Energy and represents the work of more than 500 stakeholders over the course of many months, is built upon rigorous economic modeling that estimates the impact of each strategy. The model considered two scenarios that differed by how much of the solar was grid-scale (such as a huge solar farm with hundreds or thousands of panels) and how much was distributed (small-scale, on rooftops and in backyards). Both options were found to create substantial benefits, such as reducing our greenhouse gas emissions, improving respiratory health, providing net economic benefits of over $25 billion, and creating solar jobs with median wages of between $20 and $38/hour. The scenario with more distributed energy led to more job creation (100,000 compared to just 60,000), which is one of the reasons we love rooftop solar. Earlier this summer, we reached out to you about submitting a comment on the draft version of the plan. Thanks to your efforts, the draft report received 138 public comments—an unusually high number for a DEP report. The message we sent was loud and clear: there is strong support for growing solar in Pennsylvania. So, what’s next? On its own, the report doesn’t require the state to take any action. If we’re going to achieve the goal of 10% solar in Pennsylvania, it will require a diverse and engaged movement of solar supporters just like you to fight for it. 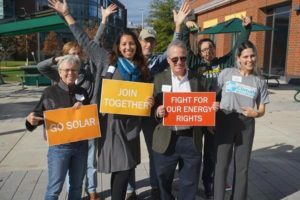 You can start by telling your representatives in Harrisonburg that you’re a solar voter. You can also join the solar movement by becoming a member of Solar United Neighbors and helping us fight for a better energy system!